Main Streets are both important places and important transportation links. These functions need to be in balance when looking at main streets. 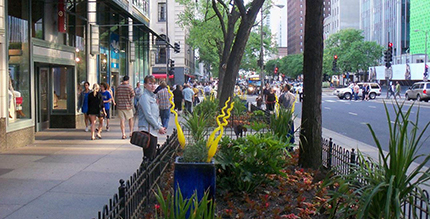 Designing vibrant Main Streets needs the support of solid City policy. In October 2015, Council moved to revise the Complete Streets policy to designate the City’s “Main Streets”, which will be designed and reconstructed to a higher standard, better balancing the needs of all users, with pedestrians given priority. How Do Main Streets Relate to Complete Streets? Main Streets are enhanced Complete Streets. Edmonton’s Complete Streets Design and Construction Standards guide all streets to be designed as Complete Streets, but it doesn’t list any high-profile Main Streets or provide detailed guidelines for enhanced streetscaping. The Main Streets Guideline addresses this gap and is an addition to the Complete Streets Design and Construction Standards. A guideline for designing Edmonton’s Main Streets was created in winter 2015. It will be used in the planning and design of Main Streets. How Are Main Streets Different? Main Streets are different than Complete Streets in some key ways. Main Streets are different than regular streets. They must meet three qualifying criteria over a distance of at least 350 meters. This map shows Edmonton’s currently identified Main Streets. This is a living list as neighbourhoods are always changing. Implementing the Vision: We are putting the Main Streets Guideline into practice on Jasper Avenue and 109 Street, and are documenting our lessons learned from these projects to strengthen the Main Streets Guideline. Prioritizing projects: We are working on a framework to identify the Main Street projects that will come next. Identifying Funding Sources: We are exploring the various funding sources that currently contribute to Main Streets design, construction, maintenance, operations, and programming to identify opportunities to support Main Street revitalization. This study seeks to transform a large portion of Norwood Boulevard to improve its livability and transportation network. A land use study for the Whyte Avenue Commercial Area portion of the Strathcona ARP. Envision 109, a streetscape concept design study, will propose streetscape improvements to improve this busy stretch of public space.